Big Box Storage is teaming up with The Village at Pacific Highlands Ranch to sponsor Father Joe's Village. 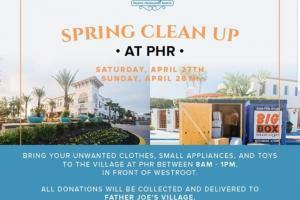 Donations of clothing, small appliances, and toys will be collected in front of Westroot at the Village at PHR on April 27th and 28th from 8am to 1pm. Everything that is collected will be taken to Father Joe's Villages in an effort to help those affected by homelessness and poverty. Fathers Joe's mission is to prevent and end homelessness, one life at a time. For 69 years, Father Joe's Villages have been serving San Diegans experiencing homelessness and poverty. They have grown to include a comprehensive campus and several locations that house over 2,000 people nightly. The new and gently used items that will be recieved will be taken to Father Joe's Villages and will be sold in their thrift stores or at online auctions, and 100% of the revenue benefit's their effort to end homelessness. Please plan on visiting the collection site with your donations to help a fellow San Diegan in need.